Being able to consistently hit your website's traffic goal and provide the right number of quality leads to your sales team are two of the most crucial responsibilities of a marketing team. But without the right tools in place, you could have wild variations in the number of visits or leads you actually generate. At the end of a month or quarter, you could end up way ahead or (more likely) way behind your goal. Using daily traffic and leads waterfall charts is a great way to ensure you never fall far behind the pace you need to stay afloat. 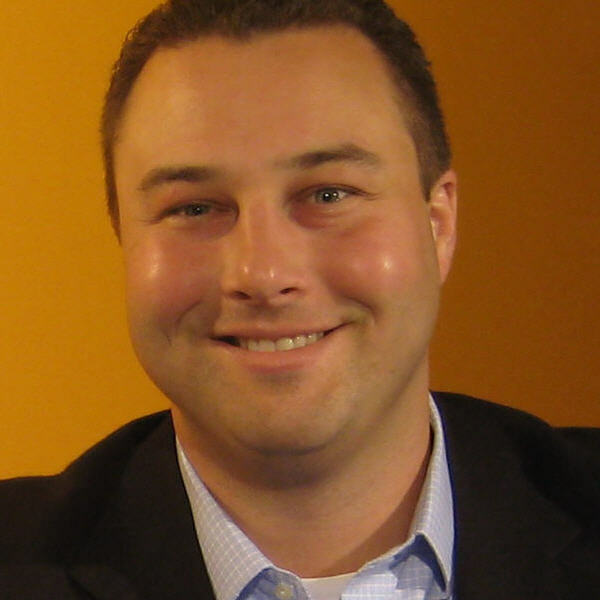 If you are a HubSpot customer, your marketing software has these reports built in. Just scroll down to the bottom of this post for more information on how to get them set up. If you're not a customer, don't worry. I'll show you how to set up each of these waterfall diagrams in Excel. First, download our free traffic and leads calculator to help determine your goals. The purpose of the traffic waterfall graph is to compare your actual traffic to your traffic goal on any given day and month. Here's how to set this up in Excel. Step 1: Set a traffic goal for the month. I recommend basing it on past traffic numbers and your SMART marketing goals. Our traffic and leads calculator can also be helpful here. Step 2: Calculate a daily traffic goal. A simple way to do this is to start with a total traffic goal and divide that by the number of days in the month you're measuring. Boom: Your daily leads goal. If you want to set a more realistic daily goal (which I'd recommend), then you can cater this daily goal to whether each day falls on a weekday or a weekend. For example, let's say there are 30 days in the month, and 22 of those are weekdays and 8 are weekend days. Let's also say that, in the past, about 85% of a given week's traffic comes during Monday through Friday. Finally, let's set your monthly traffic goal at 8,000 visits. Calculate the percentage growth you need to see on a weekday to hit your goal. Multiply your cumulative monthly traffic goal by the percentage of traffic comes on weekdays -- in this case, 85% or 0.85. Then, divide that number by the number of weekdays -- in this case, 22. 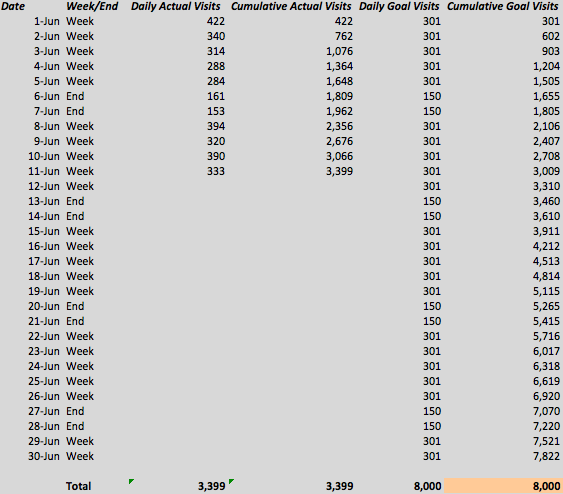 So: (8000*0.85)/22 = 309 visits per weekday. Next, calculate the percentage growth you need to see on a weekend. Multiply your cumulative monthly traffic goal by the percentage of traffic that comes on weekends -- in this case, 15% or 0.15. Then, divide that number by the number of weekend days -- in this case, 8. 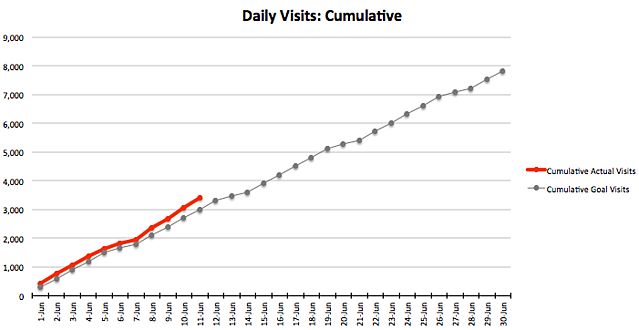 So: (8000*0.15)/8 = 150 visits per weekend day. Step 3: Create the daily traffic waterfall. Use this graph to plot your progress on a daily basis -- not just at the end of the month or quarter. In addition, share this with your marketing team so everyone can check on the team's progress and assess their own contributions. Cumulative Actual Visits: Add that day's actual visit number to the number of visits you've gotten so far that month. Daily Goal Visits: At the beginning of the month, plug in your daily visits goal, depending on whether it's a weekday or weekend. Each morning, plot your progress by plugging in the actual visit number from the previous day and adding it to the traffic you've earned over the month in the "Cumulative Actual Visits" column. Next, create a graph from this spreadsheet to create your daily leads waterfall graph. First, hide the "Weekday/Weekend" column by right clicking on the column and choosing "Hide." Then, highlight the rest of your data, including the titles of your rows and columns but excluding the "Total" row that's at the bottom. Click the "Charts" tab at the top and choose "Line" and then "Marked Line." Pro Tip: If you're finding that your "Cumulative Actual Visits" line is extending beyond the current date (i.e. that line drops to zero for all future dates), then set the proper date range by right-clicking on the white space in your graph and choosing "Select Data." Select "Cumulative Actual Visits" from the Series box, and edit the Y-values to only include the dates up until that day. Note that you will have to manually update this each day. This process is very similar to setting up a traffic waterfall. Here's what you need to do. Step 1: Decide on the definition of a "lead." First thing's first: You'll need to work with your sales team to agree on the definition of a "lead," the qualifying factors for a lead to be handed off from marketing to sales, and what leads "count" toward the goal. Step 2: Set a monthly or quarterly goal for the total number of leads. Whether you need to calculate monthly or quarterly lead goals, start with your sales goals and your conversion rates, and then work backwards to determine your lead goal. For instance, if you know you need 7 new customers next month and roughly 5% of your leads become customers, then you need 140 leads next month to hit your company's sales goals. To learn how to calculate a monthly lead goal in more detail, read this blog post. Step 3: Set a daily leads goal. Just like you did with the traffic waterfall, you should calculate how many leads you need to generate per day to hit your monthly or quarterly leads goals. Use the same process I outlined in the traffic section to find out how many leads you need each day. Step 4: Create the daily leads waterfall graph. Like with the traffic waterfall, use this graph to plot your progress daily, and regularly share it with the team. This is a great graph to share with your sales reps so they have a clear and realistic idea of what to expect from marketing. Daily Actual Leads: Plug in the number of leads you actually got each day. 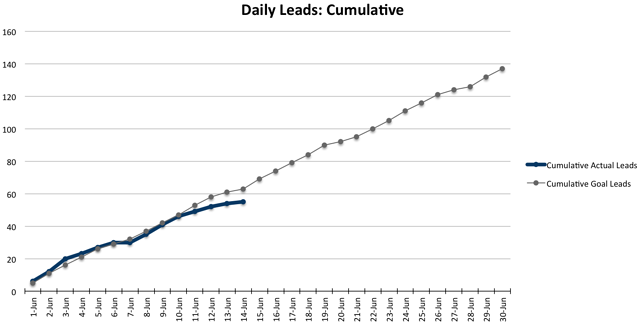 Cumulative Actual Leads: Add that day's actual lead number to the number of leads you've gotten so far that month. Daily Goal Leads: At the beginning of the month, plug in your daily lead goal, depending on whether it's a weekday or weekend. 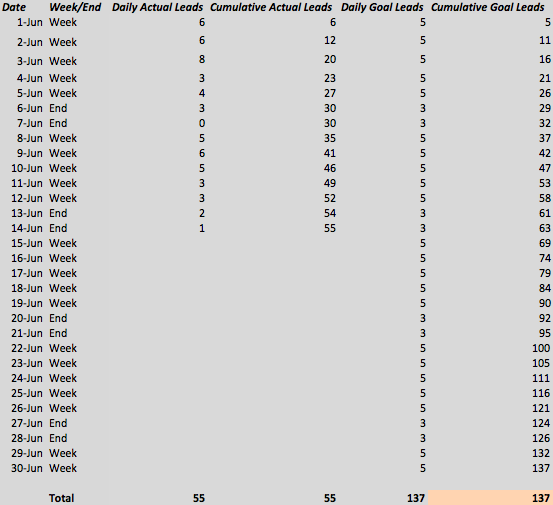 Cumulative Goal Leads: At the beginning of the month, sum your daily lead goal day over day. Unfortunately, this means you're not on track to hit the traffic or leads goal, and you're at risk of letting the sales team down. What to do? It’s time to invest in some extra work. Try to come up with additional marketing offers, create more content on your blog, step up your social media engagement, repurpose some content on new channels, and generally increase the promotions you're doing. 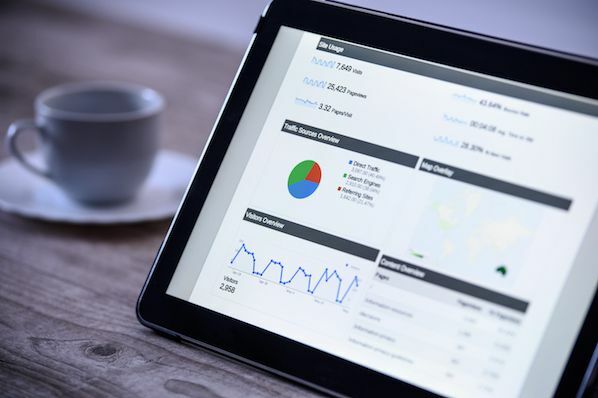 To stay safe at all times, you may find it helpful to always have backup lead generation content you can publish at a moment's notice. In addition to pumping up your inbound marketing activities, you can also keep a reserve of cash around to give a boost to some of your paid marketing campaigns or supplement your inbound efforts when you're falling behind the leads goal. Congratulations: You're ahead of the game! This gives you an opportunity to start planning more for the future. Maybe you can push some of your planned activity for this month off until next month. For example, maybe you hold off on publishing that blog article right away and instead schedule it to be published a few weeks in the future. 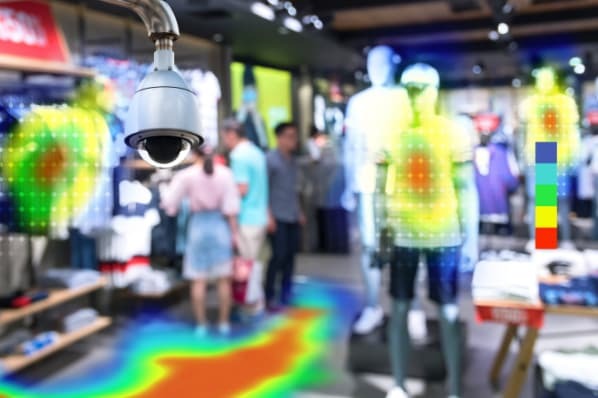 In the future, you may not find yourself so ahead of the goal line, so take this time to prepare a backlog of content and promotional components. If you're a HubSpot customer, you're in luck: HubSpot has a built-in waterfall chart template that will generated these graphs for you. To track traffic, you can find the waterfall report right on your portal's Dashboard in the Marketing Performance section. To create custom goals, simply select "Goals" from the graph's dropdown menu, and click "Set Goals" when it appears. To track leads, you can set up an Attribution Report by going to "Reports" and then "Reports Home." Here are specific instructions for how to set up an attribution report in HubSpot. You can also set up automated emails that send this report out to specific contacts (like your sales and marketing teams). Do you track your traffic and/or lead flow daily? What techniques do you use to make sure you support the sales team properly? Editor's Note: This post was originally published in March 2012 and has been updated for freshness, accuracy, and comprehensiveness.